In the fifth and final Professional Geographer essay, Scott M. Freundschuh, Professor of Geography at the University of New Mexico, notes that many IRBs "unnecessarily require research protocols to be reviewed by the full IRB, therefore impeding the progress of research projects." Rather than suggesting structural changes to the IRB system, he counsels geographers to work within existing rules. Freundschuh begins his articles with two encounters he himself had with IRBs. He does not present them as horror stories, but I will. In the first, he planned to ask children, ages 3-5, to navigate a simple obstacle course. Some would have a map, while others--the controls--would not. The IRB fretted that the controls would not benefit from instruction in map reading, and demanded that all participants benefit equally. Freundschuh does not record his reaction to this demand. I would note that every playground ever built is a monument to preschoolers' fondness for navigating obstacle courses, with or without a map, so perhaps the original proposal would, in fact, have benefited all participants. More significantly, I would suggest that if IRBs are really composed of expert researchers as they claim, they have better things to do with their time than overruling parents' judgments about what is best for their children in a case like this. The case reminds me of a 2008 comment by Liz Bankert: "I've gone to IRBs all over the country. They are thoughtful, sincere, really intelligent groups. To have all this brainpower sucked into the vortex of minimal risk research is not efficient." The second study, by one of Freundschuh's students, sought to ask participants to discuss how they perceived safety on a university campus. Predictably, "the IRB expressed concern that this study could potentially expose participants to great emotional stress if it inadvertently caused a subject to relive a violent crime." Again, Freundschuh does not explicitly pass judgment on the IRB's action, and it's not clear that he is familiar with the research discrediting this common IRB fear. In more recent reviews of research protocols, I have had to modify language in informed consent forms that reflect this growing awareness of liability. For example, I’ve had to remove the statement “This research project has been reviewed and approved by the University,” and I have had to add the words “without prejudice” at the end of the statement “[participants] can stop their participation in this study at any time.” Neither of the preceding examples modified the risk to participants, but they do reflect the university’s responsibility for the IRB review process. I'm not sure what he means by that last comment. The university demands that researchers submit protocols for review and get the university's approval, but then forbids them from sharing this fact with research participants. This strikes me as reflecting the university's refusal to take responsibility for its process. And I would be interested to meet the research particpant for whom the addition of the words "without prejudice" clarified rather than obscured the terms of an agreement. Freundschuh states that the University of Minnesota's now requires first time IRB applicants to complete an online training course that "takes approximately five hours to complete." While he does not directy register his opinion of the relevance of these tutorials to his work, Freundschuh does call for "the development and implementation of an ethics curriculum for geography faculty and departments," ideally with the aid of the Association of American Geographers. Does this suggest that he found the current tutorials lacking? The good news from Freundschuh is that exemption and expedited review is working somewhere. He states that expedited review "is much faster [than full-board review], sometimes taking only a day or two rather than months," and that "Studies that I have conducted that have been exempt have gained that status in a single day." Since this is not the case everywhere (Sugarman et al. found that expedited review at medical centers "costs about the same as full protocol review"), it would have been helpful for Freundschuh to note which of institutions have achieved this standard. Social and behavioral research that typically involves minimal risk to human participants has often, at the dismay of the researcher, had to undergo IRB processes that are designed to assess the greater physical risks associated with biomedical research. In most instances, this level of review is not necessary. For example, a study protocol that measures the effectiveness of a new chemotherapy treatment will necessarily require greater scrutiny and control than a study that interviews residents to learn their views about a newly planned highway. The impact of these more onerous review processes has raised the concern that these processes interfere unnecessarily with the progress of research, creating unnecessary burdens and delays. It is not uncommon for the processing of an NSF award to be held up while the PI waits for her or his institution’s IRB to complete its review of a proposal. There have been instances where program officers at NSF have had to inform IRBs that an award was in jeopardy because of the long wait for review of a research protocol that could have been exempt or expedited. 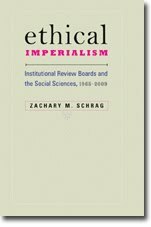 But Freundschuh's article shows no awareness of the longstanding critiques of the application of IRB review to the social sciences. In 1979, such critiques led the Association of American Geographers to join in a call to bar the regulation of conversations between consenting adults. More recent critiques--such as those noted by Martin and Inwood--have not yet produced comparable action. For example, the AAG seems not to have responded to the 2011 ANPRM. Contrary to Price's claim that we have had enough complaints, perhaps geogrpahers need more. Instead of exploring this possibility, Freundschuh tells geographers to study up on the Common Rule enough to challenge IRBs that lack the basic competence to distinguish an exempt protocol from one requiring full-board review. I hope geographers are bolder than that. I appreciated the candor of the author and his observations. Each IRB must apply the federal regulations but as both Schrag and Fruendschuh note, individual IRB policies and procedures may impair research. I found the example of research with children to be interesting. It is true that IRBs should consider the benefits of the research. The key being the term "research". There is not a requirement that each participant directly benefit. In this example, the IRB in question seems to be overly conservative in the application of the term "benefit". Researchers should be aware of the code of federal regulations and if appropriate question the decision or comments of the IRB (in a professional manner). I was part of a research team looking at the result of menu labeling on food choices. We planned to present participants with a regular menu, ask them to make selections. Then participants were given the same menu but with calorie and fact content for each item. Since the focus of the study was to examine how the presence of the nutrition information changed food selection, we were shocked when the IRB (medical academic institution) requested a rationale for not providing the menus randomly. Because I have IRB experience, I responded with a reminder of the purpose of the study and a request for clarification on how this request applied to the CFR and ethics of the study. The IRB agreed and did not require a revision. It is the role of researchers and IRB reviewers to protect participants. IRBs should do this without imposing undue barriers which do not affect the ethics of the study or the safety of participants. Thanks for this comment. I fear that relatively few researchers have the knowledge or gumption to contest inappropriate demands as you did.